The American Specialty Toy Retailing Association (ASTRA) has just released their 2009 Best Toys for Kids Award Winners. Selected by a panel of 500 of America's top independent and neighborhood toy retailers, the winners deliver exceptional value and expand a child's imagination by inviting discovery and exploration, getting kids moving, and building creativity. There are toys on the list that we already have and love, like the Green Toys Tea Set and Automoblox vehicles but there are also plenty of toys that are new to us or, at least, new to our list! The Playmobil Pyramid that Candice reviewed, for example, and the Wee WEDGiTS building blocks. We received a Reversible Dragon/Knight Cape and matching Reversible Dragon/Knight Hood from Creative Education of Canada's Great Pretenders collection of dress-ups. I can't tell you how great this is, especially since quality dress-up clothing for boys is not easy to find. Roo was so jealous that this was slightly too small for her and was thereby deemed Jasper's! 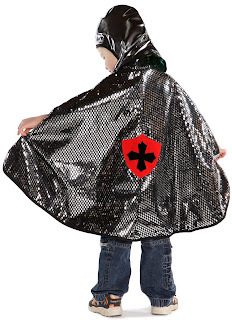 Disclosure: We received the Reversible Dragon/Knight Cape and matching Reversible Dragon/Knight Hood and were encouraged to spread the word about ASTRA's 2009 Best Toys for Kids Award Winners. However, relating the sheer awesomeness of the dress-up and other items from the list was done on my own. I love that! Especially that it's reversible. Now the knight can fight an inner battle with its own dragon.